The Counties 2018 were a fantastic experience. It’s a fast-paced, heart-thumping, adrenaline-pumping thrill ride. Just getting there is an achievement and the experience can bring with it different emotions. But for all: pride, and hope for the future. 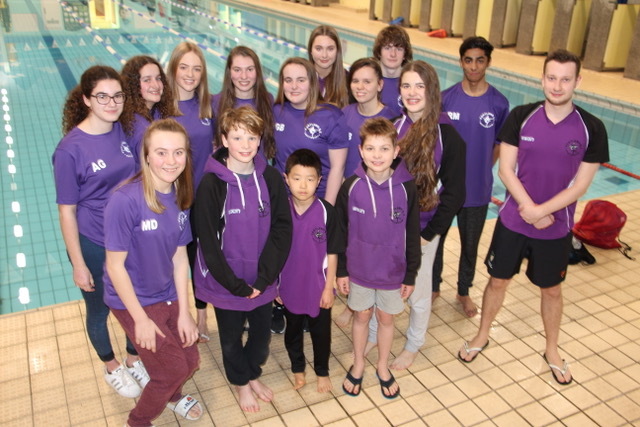 We had 17 swimmers competing this year, some for the very first time. This is more than three times the previous year – a fantastic accomplishment by Head Coach Matt and his team. There were 51 races swum, 8 finals reached and 5 medals won. Best of all, every swimmer truly did put everything into their races. The team spirit poolside was tangible, and a special mention must go to Erin, who couldn’t swim her race due to a broken toe, but turned up to heartily support us anyway. Ed had lots of races, but particularly noteworthy for me was his 100m Free, in which he swam a brilliant PB and is the quickest in the club at this distance. (Ed, let’s see who can go sub-minute first!). We had the most qualifications for the girls’ 50m Fly and among those was Angelina, Georgia, Rebecca and Lucy. The atmosphere poolside was great, PBs were swum and there were lots of smiles. This marked Rebecca’s last Counties: she went out in style with a PB and a hoodie! She is a fantastic role model, with amazing commitment to the Club and swimming in general. She also wins the prize for the nicest swimming costume. Sorry Stan, you came a close second! There’s a very promising bunch of younger boys: Ethan’s fly race was a pleasure to watch (I’ll be picking up tips for technique); Judd transferred all of his bundles of energy into some fantastic swims; and Taka swam about a million races – giving it his all and handling the pre-race pressure like a pro. Mai put in some strong performances and had done well to qualify for a handful of races, (not entering them all though as they clashed with her birthday celebrations!). Congratulations also go to Izzy on a fast 50m Free. Alongside Ed, our older boys put in some great performances. Raj swam some impressive breaststroke, and Stan pulled through injury to race hard and competitively. He’s one of those swimmers that I envy: good at every stroke! It was Harrison’s first Counties, and he made it into the final of the 50m Breaststroke – a notable achievement. Definitely watch this space… Gaby performed to her usual high standards, and swam out of her skin to win a bronze in the 50m Fly, (gaining a Midlands qualifying time to boot). I was thrilled to reach the finals for my races, winning 3 silvers and a bronze: more than I could have hoped for. A big thank you to the Morroll family who gave me the loudest cheers I’ve ever had at a final! I’m now looking forward to competing at the Midlands. Everyone was fun and supportive at poolside; a testament to Portland’s ‘big family’ feel. But Counties mean different things to different people. On one level, the Counties provide the opportunity for individual achievement. But for me, it was just brilliant to witness the pride Portland swimmers have in their club. We represent the hard-working coaches, all the volunteers, our parents who give up so much time (and their morning lie-ins) to give us chances to swim, and ourselves. I was proud to sit by the pool in my purple top, to wave when my name was called in finals, and to stand amongst my fellow Portland swimmers. To the 17 who swam and the many who aspire to, I say, Counties is a goal and not everyone can get there, so we should be grateful for every time we get into that championship, because we represent all those who are trying their very best to be there with us.